The easiest way to get to Istanbul is by plane of course. Turkish Airlines and many other world airlines have regular daily flights to Istanbul. There are also local airliners that run charter flights to Istanbul especially during holiday season such as summer months or Easter and New Year’s period. Some of the direct flying times are: Newyork – Istanbul 10:20 hours, London – Istanbul 3:45, Milan – Istanbul 2:45, Hong Kong – Istanbul 11:50, Moscow – Istanbul 3:05, and so on. 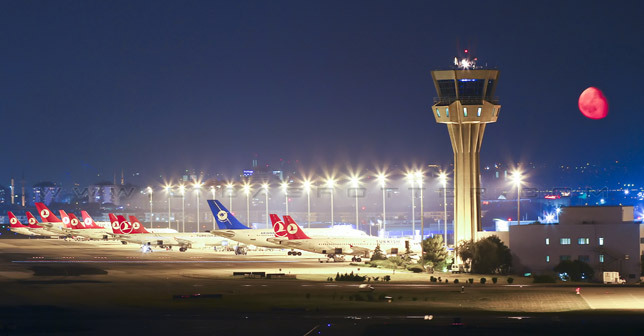 Istanbul has two international airports; one on the Asian side (SAW – Sabiha Gokcen Airport) and the other one on the European side (IST – Ataturk Airport). From Istanbul you can fly to many other cities of Turkey as there are frequent daily flights of different airline companies. Istanbul – Izmir or Istanbul – Ankara flight takes about 1 hour, Istanbul – Adana about 1:30. Istanbul is well connected to many European cities by highways. Some private Turkish bus companies run scheduled buses to Istanbul from Germany, Austria, Switzerland, France, Greece, Bulgaria, Saudi Arabia, Syria, Iran, Jordan, Russia, Georgia, and Romania. Once you’re in Istanbul, there are countless of local bus companies that can take you to all corners of Turkey with their modern buses. Buses are frequent and plentiful, they usually depart from the Bus Station (Otogar) in Esenler neighborhood but they also have ticket offices all around the city, especially in Taksim, Sultanahmet, Besiktas, Kadiköy etc. You can also easily drive to Istanbul from any European country with your own car or motorbike. By car, there are mainly two borders to get into Turkey: Kapikule in Edirne coming from Bulgaria, or Ipsala coming from Greece. There is a nice highway between Edirne and Istanbul, it’s about 225 kilometers (140 miles). After Istanbul, you can drive anywhere inTurkey as there is an extensive road network. However, it’s not recommend to drive with your own car in Istanbul because the traffic in this mega-city is pretty dense and sometimes caotic. The best way would be to park your car and use public transportation or taxis. Turkish Railways Authority (TCDD) has regular train schedules from Istanbul to Budapest – Hungary, Bucarest – Romania, Kishinev – Moldova, Salonica – Greece and Sofia – Bulgaria in Europe, or to Damascus – Syria and Tehran – Iran in the Middle East. For example, Istanbul – Salonica takes about 12 hours by train, Istanbul – Tehran takes about 68 hours. International trains arrive at Sirkeci station on the European side, or Haydarpasa station on the Asian side of Istanbul depending on where you’re coming; from the West or from the East. Once you’re in Istanbul, you can get a train connection mainly to Ankara, Eskisehir, Denizli,Van, Kars, Gaziantep, Adana, and Konya. There are several maritime companies that run car and passenger ferries from Greece or from Italy to Turkey. Most of these arrive at Çesme near Izmir, but some to Istanbul as well, especially during the summer. There is also a regular ferry line between Odessa (Ukraine) and Istanbul which takes about 35 hours. Many cruise ships dock at Istanbul too for daily excursions. From Istanbul, you can get a ferry connection to Izmir, to Bandirma near Balikesir, to Mudanya near Bursa, to Yalova, or to Marmara Island. Within the city, Urban Maritime Transportation (IDO) runs passenger ferries between both sides of the Bosphorus. Taxis are the easiest way to get into town and are available outside the airport. All taxis are yellow and have fitted meters. The journey takes about 30 minutes. The cost of the getting from airport to Taksim or Harbiye area is about 50 – 60 TL (28 – 33 USD). You may also take the HAVATAS Airport shuttle bus to HAVATAS bus terminal at Taksim. Journey time is 40 minutes approximately, but it may vary according to the intensity of the traffic. You can walk to congress venue Harbiye Cultural and Convention Center in 15 minutes. HAVATAS bus costs 10 TL / person and taxi costs around 7-8 TL.